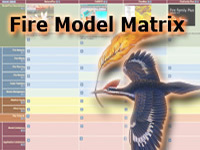 The Fire Model Matrix is an on-line resource that presents four fire community models in a matrix that facilitates the exploration of the characteristics of each model. As part of the Advanced Fire Weather Forecasters Course, this matrix is meant to sensitize forecasters to the use of weather data in these fire models to forecast potential fire activity. great tool to work with very good cross reference. Very good Information in the lesson that gives good guides.